Canberra: Peter Dutton, Australia’s Minister for Immigration and Border Protection today took potshot at the Australian labour Party by accusing it of possessing a very short memory when it comes to border security matters. 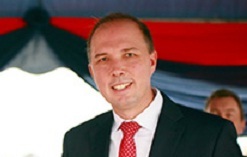 Dutton issued a statement today dubbing a media release by Richard Donald Marles, an Australian politician and the Shadow Minister for Immigration and Border Protection, as farcical. Dutton said Marles cries crocodile tears and says he is concerned about the PNG Supreme Court decision and calls for all sorts of actions. For the record it was Labor that entered into the arrangement with PNG, the Australian Minister for Immigration and Border Protection has pointed out adding Labor entered into an arrangement because they had no idea what to do with the thousands of people arriving illegally during a period when they had surrendered our sovereignty to criminal people smuggling syndicates. Dutton has pointed to 1200 people who drowned during “Labor’s incompetence” and asked Where was Mr Marles during this period? Amidst the comical statements of Mr Marles there were some familiar words, Dutton observes in his statement and goes on to draw a connection between what Richard Marles and Opposition leader Bill Shorten were saying. According to him both are sounding very similar to former Prime Minister Kevin Rudd and his approach before the 2017 Federal election. According to Dutton, Labor’s game is to make people believe they will continue the successful policies of the Coalition Government when it comes to border protection policy. Dutton has hit hard stating: “The trouble is Labor talks a tough game from Opposition and then goes weak at the knees in Government when the Left demands a backflip.